Made entirely of wood, Red River carts could be repaired with what was on hand. If a cart broke down, any local wood from trees such as poplar, elm, willow or Manitoba oak could be used to make quick repairs. While trees are not plentiful in some parts of the Prairies, they can be found in coulees and along river and creek banks. When disassembled, Red River carts also became temporary rafts for water crossings. Once the wheels of the cart were removed and its bottom was enclosed in a buffalo hide tarp, the cart and its cargo could be rafted across rivers and streams. 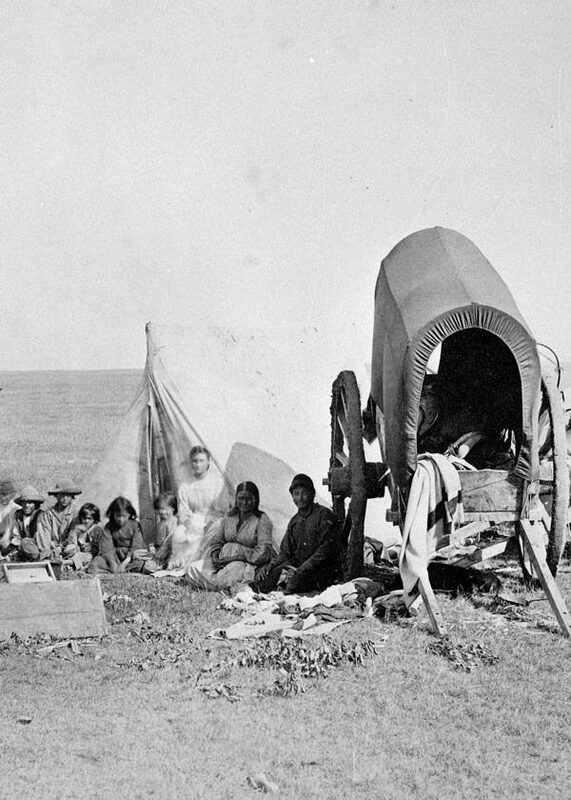 A Métis family camping on Canada’s plains in 1872. The two-wheeled Red River cart was the primary mode of transport during the 19th century expansion west. Although there were no standard measurements for a Red River cart, it typically had a box measuring four metres in length, one metre in height, and half a metre in width. Its axles were two metres long, its wheels one to two metres in diameter, and its shafts, measuring four metres each, ran from the box to the horse or ox. Its hubs were usually made from elm, wheel rims from white ash or oak, and the axle from hard maple. All the carts’ wooden pieces were fashioned together by sinew and rope. When the carts broke down, all that was needed for their repair was a bluff of trees, an axe, a saw, a screw auger and a draw knife. Even the nails on a Métis-made Red River cart were wooden. The wooden wheels would sometimes become stuck, which made any movement impossible. Red River carts made a loud squealing noise when they moved because their wooden axles and wheels could not be effectively lubricated without collecting dust. A First Nations’ legend maintains that the bison deserted the Plains because they wanted to escape from the hideous noise of the carts! For the Métis, the Red River cart was an all-purpose utility vehicle and a makeshift home. Métis families used Red River carts to move their possessions while migrating or resource harvesting. The carts also provided migrating Métis with temporary living quarters and shelter from the elements. Women fashioned decorated covers for the carts from bison hides or canvas, which were supported by an arched frame of cut saplings. In the winter, the Red River cart’s passenger box, when placed on runners, served as a temporary horse-drawn sleigh. Red River carts were also used as a defensive mechanism when the Métis were threatened. Inside a protective circle of carts, women, children and animals could hide safely, while men would attend to the defences. Often, many carts would be tied together to form trains of carts. 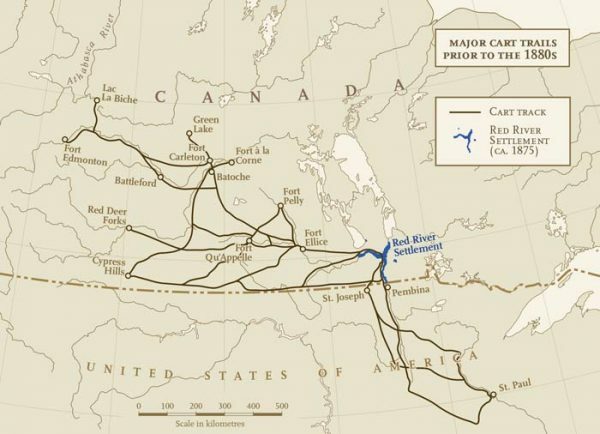 These cart trains linked settlements together and opened up Western Canada to commerce before the coming of the railway. A Red River cart pulled by a horse could transport the same amount of cargo as four pack horses. Horses were able to carry more than 200 kilograms at a rate of up to 80 kilometres a day. The same carts pulled by oxen could carry almost 500 kilograms at a rate of about 30 kilometres a day. Red River carts hauled such goods as pemmican, buffalo hides, furs, moccasins, decorated tanned skin clothes, sugar, tobacco, tea, powder, shot, bullets, point blankets, cloth, vermilion, axes, knives, files, copper kettles, guns and alcohol. Métis families used Red River carts to move their possessions while migrating or resource harvesting. As the Métis became free traders in the 1830s and 1840s, Red River carts eventually superseded York boats in the volume of freight hauled. By 1869, approximately 2,500 carts left the Red River Settlement for St. Paul, Minn., outside of the jurisdiction of Hudson’s Bay Company. Carts transported goods from St. Paul to Lac La Biche, Alta., and then York boats hauled the cargo down the Athabasca River. With the coming of railways, opportunities to haul freight on Red River carts greatly diminished. However, even as settlers entered the Prairies, the Métis used Red River carts to haul wood, Seneca root, bison bones and other raw materials to market. Red River carts are an important Métis symbol, demonstrating the Métis’ freedom and skill as business people. Today, the Red River cart appears on Métis flags, including the Manitoba Métis Federation flag. It also appears on logos such as those for the Clarence Campeau Development Fund (established by the Métis Society of Saskatchewan), the Métis Nation of Alberta and the Métis Nation of British Columbia.